Well, the final episode aired last night and what a way to end the series. Yes, there are no more episodes of Downton Abbey. 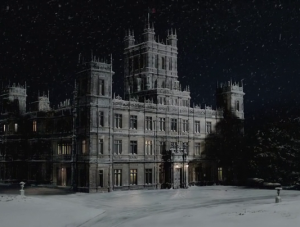 The Carnavrons have reclaimed Highclere Castle from film crews, and the production sets used for the downstairs scenes have been packed away. We must be resolved to gracefully let these beloved characters live out their lives without us watching. 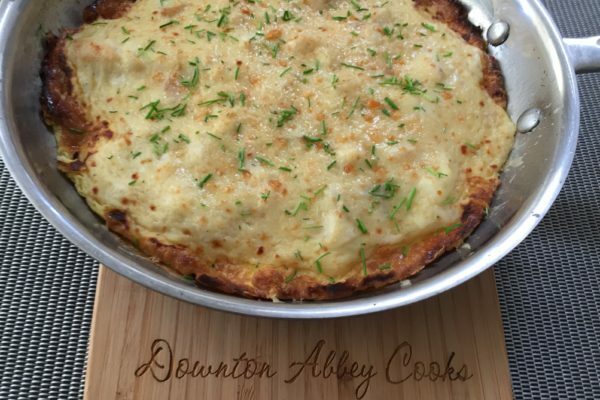 This will be my final recipe to share as my love letter to the Downton kitchen staff and to those fans who love the food on the show. 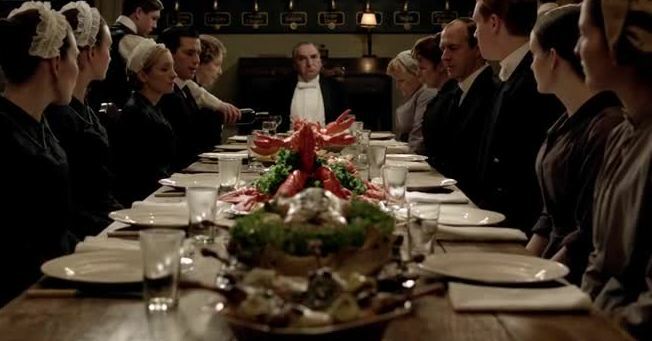 We first met the Crawley family over breakfast as they learn about the sinking of the Titanic; Mrs. Patmore’s dish that morning was kedgeree, so I thought it fitting to return to the beginning to feature another breakfast fish dish. 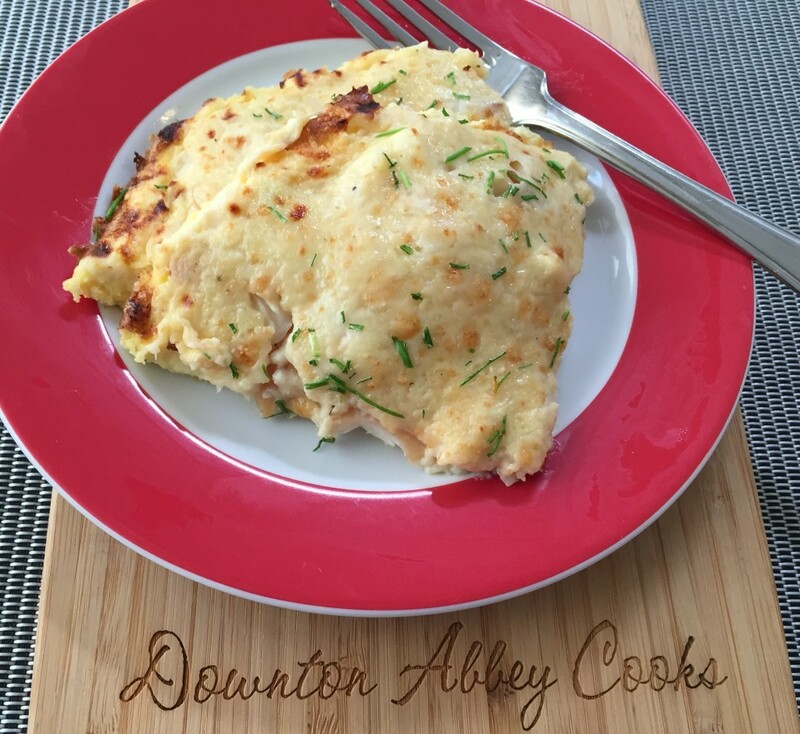 The recipe is Omelette Arnold Bennett, invented at the famous Savoy which uses finnan haddie, smoked haddock. It is a fabulous morning after dish to soothe the broken heart of any Downton Abbey fan. Don’t despair, I have share 100s of recipes so you can easily find them through the Recipe Index. And I will still be active on Twitter, Facebook and Instagram. The end has come, we have shed our tears, and while we hope there is a movie in our future, we can’t help but reflect on the past six years. We have all been impacted by the series in our own way. As for me, well this show changed my life in the most unexpected ways. Thank you for your support along the way. My journey started innocently enough. Lord D raved about a historical drama he had found where everyone followed the same code of honor, respect, and etiquette. He loved the life upstairs, imagining his own relatives living in the grand house. As a cook I yearned to learn more about what was going on downstairs, what was prepared, and how. 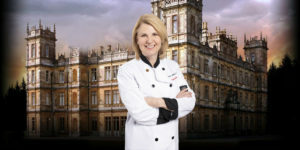 So I started a blog for fellow food fans, “proposing to share traditional receipts (recipes), taking cues from the episodes.” There were only 51 episodes in the series so there was much Downton Downtime to share regional recipes that would have been enjoyed in the era, often served with a short history lesson, and made healthier where possible. My most ambitious undertaking cooking dishes from each class of service of Titanic in honour of the 100th anniversary. 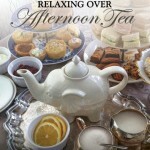 And there were many Afternoon Tea recipes on Tea Tuesdays. I was astonished and humbled at the amount of attention my writing received; as American audiences discovered the show, the press wrote more about various aspects of show including food and looked to me for content. My press page reflects the print, radio and TV interiews around the world. I also found myself doing personal appearances talking about Downton food. 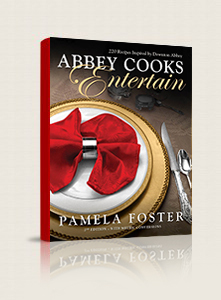 Fans began to ask me about what to serve at Downton-themed parties, so I created online guides with menu suggestions listed in my Recipe Index, when I was approached by a couple of publishers, including Penguin, I stubbornly decided to self-publish. 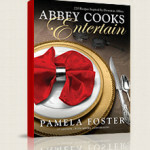 No one was more surprised than about my two cookbooks: Abbey Cooks Entertain and Relaxing Over Afternoon Tea were written for fans who love to entertain. I feel so blessed to have been a part of your journey through Downton Abbey. I can honestly say that I have never been impacted by a TV show in this way before. Don’t dispair, I may not be actively blogging, but I will still be active on Facebook and Twitter. 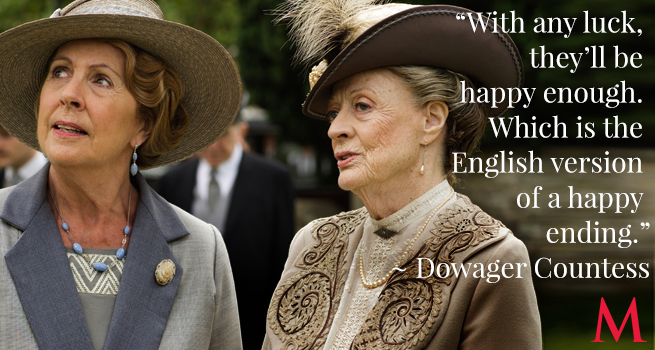 How Did Downton Impact your Life? 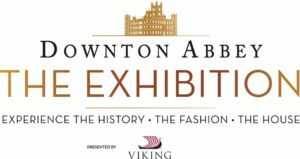 I would love to hear your stories about how Downton impacted you. Use the comments section below to tell your story. Third time is a charm as Edith finally gets her happy ending, outranking Mary a wonderful bonus. Mary and Henry are expecting a child. Henry and Tom have opened a car dealership together, giving them both something to do. Anna and John welcomed a new child into the world, delivered in Mary’s bed, no less. Daisy is finally in step with a fella, Andy the lucky lad. Daisy decides to move to the farm with Mr. Mason. It might be a little crowded at the farm as Mrs. Patmore and Mr. Mason also have sparked a romance. Molesley is on his way to becoming a well respected teacher. Isobel finds her own happiness with Lord Merton. Mr. Carson is able to retire with grace. Thomas realizes his dream of becoming the butler, encouraging him to be a nicer person. Ms. Edmunds catches Edith’s wedding bouquet which is a hint that she and Tom might spark a romance. Robert finally embraces Cora’s need to have a career to call her own. Spratt has a budding sideline career as a journalist. Afternoon Tea: what a lovely way to host fellow Downton fans as you share your favorite story lines, and if there will be a movie in the future. 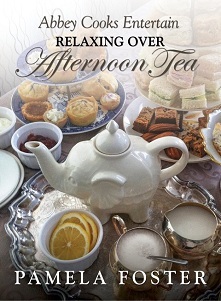 The book contains 60+ recipes for tea treats, the three S’s: scones, sandwiches/savouries and sweets. The book provides a brief history of afternoon tea, tea etiquette and tips on how to host your own tea for fun or fundraising. Amazon sells the print version and Kindle versions, or a you can download PDF version here. 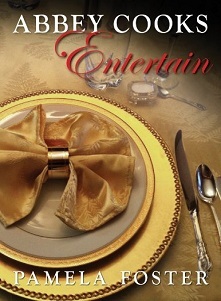 Whether you are hosting 2 or 20, this book has lots of ideas. Containing 220+ traditional Downton era recipes with a modern twist, this is a great book to create some simple or complex dishes for your Mary or Anna. 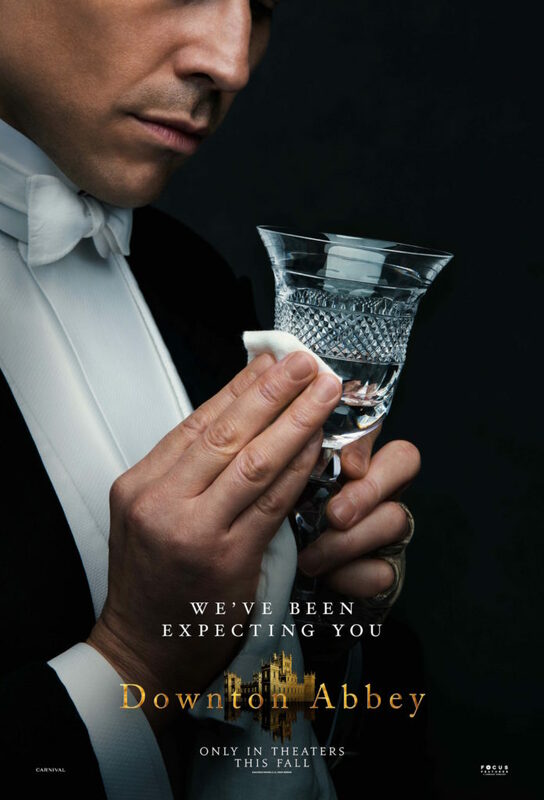 This 448 page ebook has been updated to include both metric and imperial measurements and now includes famous Downton dishes throughout the series. Print Version is here. The good news is that the 2nd Edition is available on Amazon. The full book is 450 pages. Just as Granny famously asked Matthew to explain”weekend”, Americans really don’t understand the English Wedding Breakfast. 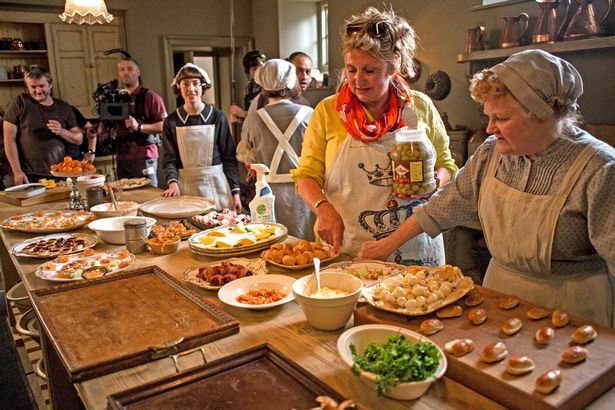 Mrs. Patmore is always complaining about having to rush back to the house to prepare the wedding breakfast, that would mean weddings would happen at the crack of dawn, right? Not likely. Traditional wedding breakfasts have little to do with the normal concept of breakfast – in fact, in most weddings, the wedding “breakfast” is actually a dinner that’s held either just before or after the reception. The Servants were served the wedding breakfast after Edith’s failed wedding. The semantics may seem a bit dodgy, but the original history behind the concept is easy enough to trace. Before the Reformation in the 16th century, the ceremony was held after mass. Everyone fasted before mass, so part of the intent of the “breakfast” was that it would be the first meal the bride and groom shared together. In English lore, part of the tradition of the wedding breakfast also dates back to the 18th century, when the law dictated that all masses had to be held before noon, thus partially dictating the timing of the wedding breakfast. In Scotland, however, weddings generally take place in the afternoon. Today, the wedding breakfast may still follow the ceremony, but this “short” meal is often extended until late afternoon or early evening, when caterers will begin to serve hors de ouvres prior to the reception, after which an optional wedding dinner will sometimes occur. Regardless of the timing, though, it’s a safe bet that no one will go hungry. There are references to smoked fish in Scotland going back to the 16th century. James Boswell wrote about them in the 18th century, mentioning that Scottish smoked fish could be obtained in London. But these were heavily smoked (as a preservative) and a bit tough. In the late 19th century, as fast transportation by train became available, the Aberdeen fishing village of Findon (pronounced locally as “Finnan”) began producing lightly smoked and delicately flavoured haddock (haddies) which were of a much finer texture. They were an immediate success and variations on these tasty fish have become very popular. They can be simply grilled with butter but here is a recipe with milk and onions which turns them into a delicately flavoured fish stew. This famous dish was created by Jean Baptiste Virlogeux, a chef at the Savoy for British novelist Arnold Bennett during his stay while researching the second of two books he set in the hotel. It has been on the menu there ever since. Prepare the fish: Mix the milk with all but 2 tbsp. of the cream, pour it into a large shallow pan and bring to the boil. Add the bay leaf, onion, nutmeg and peppercorns, and bring to the boil. Add the smoked haddock, bring back to a gentle simmer and poach for 3-4 minutes, until the fish is just cooked. Lift the fish out onto a plate and leave until cool enough to handle, then break it into large flakes, discarding the skin. Make the sauce: Melt 1/2 the butter in a small pan over medium-low heat, then whisk in the flour. Cook for a couple of minutes, then gradually whisk in the fish poaching liquid and cook until it thickens. Take off the heat. Whisk the egg yolks with the remaining cream, then very gradually whisk into the sauce. Stir in the fish and season to taste. Pre-heat your broiler/grill to high. Make the omelette: Whisk the eggs together a bit of seasoning, but go lightly on the salt. Heat a small non-stick frying or omelette pan over a medium heat, then add the remaining butter and swirl it around to coat the base and sides of the pan. Pour in the eggs and, as they start to set, drag the back of a fork over the base of the pan, lifting up little folds of egg to allow the uncooked egg to run underneath. Finish the dish: When the omelette is set underneath but still very moist on top, remove from the stove. Spoon on the sauce, add the Parmesan cheese, then put the omelette under the hot grill until lightly golden brown. I like to divide the omelette into quarters, plate, then serve. This dish was not created until 1929 so perhaps we might see it served in a future Downton movie. I enjoy the connection of this dish to the final episode of Downton. The Savoy once boasted the talent of Chef great Auguste Escoffier (who founded the school where Albert trained) and Cesar Ritz, who found The Ritz, where Edith and Bertie rekindled their love in the final episode.